Many fashion bloggers from all over the world are constantly showcasing one-of-a-kind shoes on their websites. Since another month has reached its end, it’s time, once again, for us to discover more unique and interesting footwear designs from a number of these stylish shoe bloggers. Gladiator sandals are here to stay. They are always in style, and they never fail to make an outfit look chic. When we spotted Katia Nikolajew of Bewolf Clothing in a pair of gladiators, we thought of including her on this list right away. Her gladiator sandals are exceptional! They are perfect for spring as they feature multiple bright colors, a floral design, tribal prints, and candy-colored embellishments in different shapes. 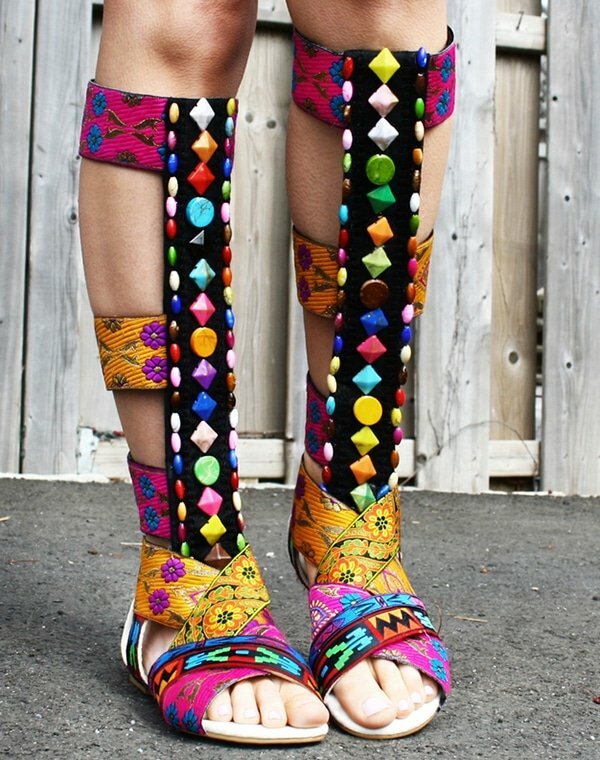 Have you ever seen a pair of gladiator sandals of this kind? We also love how it matched Katia’s necklace, orange knit top, and white frayed shorts. Unique, huh? Macarena Ferreira of The Material Girl wore several interesting looks last month, and we decided to include two of her latest outfits on this list. The first is an ensemble of sweatpants, a floral top, and a pair of pumps. Sweatpants are usually worn with sneakers and a sporty top, but Macarena opted to do glamorous styling. Amazingly, she looked flawless! We’re just love her pumps that feature PVC side panels, ankle straps, and suede cap toes and heels. The second outfit is chic nautical and included a neon crop top with a crossover back, a pair of blue-and-white striped shorts with a cutout detail and scalloped trims, and a pair of neon pink sandals with tonal pyramid studs. Her sandals clearly added more brightness to her already glowing outfit. Floral shoes are hot this season, and Alana Ruas showed an interesting pair on her blog. Her wedge shoes define spring fashion as they feature allover floral print in multiple colors. They worked perfectly with her high-waisted denim shorts, black top, and blue blazer! Her oversized yellow envelope clutch also added more color to her spring look. Borjana R. of Bees Wonderland showed a classic-contemporary look in cuffed jeans and a plain white top, which she styled with a unique oversized necklace. Her white necklace, which seemed like a part of her blouse’s design, was hard to ignore, but our eyes were also glued to her sandals. Her heels feature white and gold embroideries, black tassels, and some beads, giving her look added character! Patricia Moreira of Toda Charmosa shared a fresh spring look in an outfit that included a white top and a printed miniskirt in dominant blue. A perfect match to her lovely outfit was a pair of blue platform pumps featuring metal embellishments on the ankle straps. Floral is one of the staple designs this season. We saw a lot of it last month and we’re expecting to see more of it in the coming months. Like Alana Ruas, Yuzi Katrina (Blog Offline) also wore floral heels. Hers were floral-printed wedge sandals that feature crisscross front straps and ankle straps. Stripe patterns are also popular in spring, and we’re glad to see Ananda Saba of Super Fashionable wearing striped heels. She displayed a fashionable nautical look as she paired her striped sandals with a matching jacket to glam up her plain white top and jeans. Stripes and florals are this season’s popular trends. 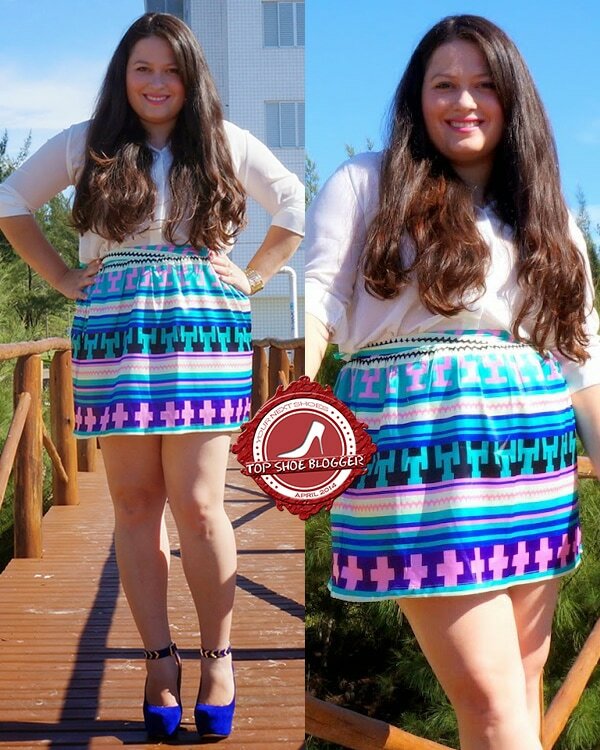 Gaby Gomez of Moda Capital-Blog rocked both in one look, and it’s why she deserves this spot. She wore a pretty floral mini dress and paired it with striped wedge sandals. We also saw her in unique Coach sandals that feature black vamps, open toes, ankle straps, and knotted straps at the sides. We love how they complemented her leather skirt and denim top. Mai Sunshine of Little Mai Sunshine decided to go back to the basics and wear a monochrome number of just a plain white crop top and black pants. She strategically wore this ensemble to keep the focus on her killer heels. Her Jeffrey Campbell sandals feature eye-catching lion head medallions, and they certainly gave her laid-back look a fab twist. Didi Ibarra Rake of Dolce Placard is into girly looks lately. In one of her photos below, she is in a girly lace top and a floral skirt — just the right combo to welcome spring! Her feminine pointy pumps with fuchsia and pink trims, fuchsia heels, and black-and-white striped outsoles perfected her lovely spring look. In the second photo, she is wearing a simple black dress at a fashion event. Although the dress is plain, the orange-and-pink sandals are colorful enough.